It's been on my to-do list for the longest time now, and ever since I finished summer school last week, I decided to finish the girls in my header. Considering I created this layout during summer school season, well, a slight revamp was in order! Huzzah! 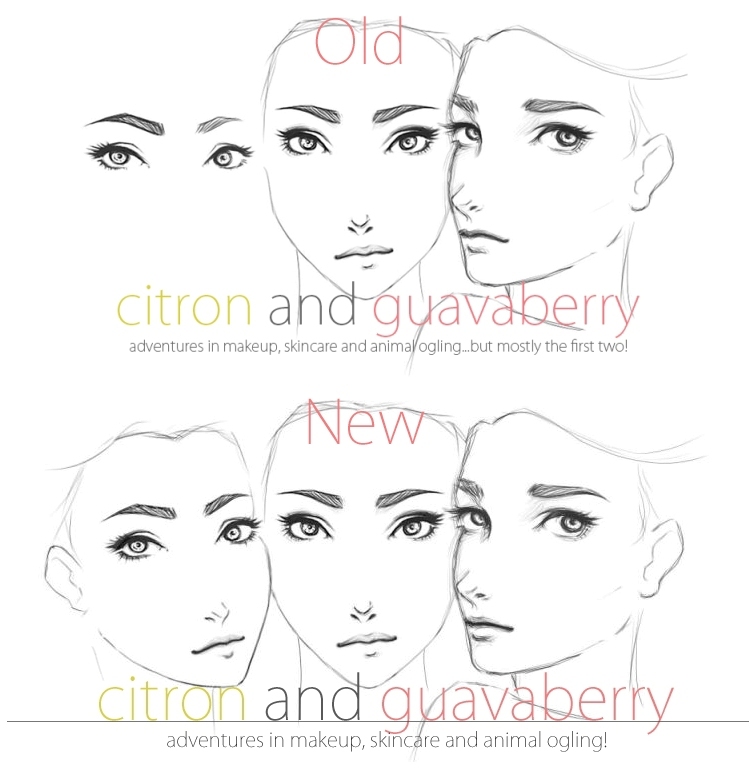 And the blog now has more citron and guava coloured accents, so yay for that. As for blog buttons, I kinda like! I've got blog buttons of my own but don't have them on my sidebar or anything - it's got its own little post and people who want to use it, take it. Other than that, it's whatever. xD I think a blog roll is awesome, (but I keep freaking out at how "busy" a layout will look like with so many buttons...) why am I so crazy idk. Oops, I actually meant social media buttons, haha! ALRIGHT, WHAT DO YOU WANT ME TO DOODLE. DOG IT IS. Any dog? Yeah I was thinking that! But I don't have instagram and the only links I'd have would be Bloglovin and twitter...so they would be lonely ._. Both headers look awesome so whatever you decide will look good regardless! You could just make two big ones then? Make them all sketchy like the header...? It's not bad! The old header seemed artsy, which was cool, I liked it, but the completed look works too. I like the additional color accents. It ties in the whole webpage nicely. GET SOCIAL MEDIA BUTTONS. Be out there as much as possible. You'll be able to connect with more people (or more easily with the peeps you're already connected to). Most of my page views have come from Pinterest, Tumblr and google. Also, I was thinking about starting a facebook group for small blogs. We could all talk, ask each other quick questions, blog advice, etc. What do you think? i think a forum to connect small blogs would be great! i would love some way to generate new ideas and get some advice on my blog. also, i think its a great way for us to all support each other while increasing each other's readership. Yes! I'm glad you guys are on board. I'm gunna take a couple days to think up the details and how to get more small bloggers involved. get social media buttons. makes it easy for ppl to follow. but i would focus on the outlets you actually have energy to utilize. be strategic and don't spread yourself too thing. here's another idea. get something like disquis or instadebate. i find the default blogspot commenting system difficult to really connect with bloggers. i never get pinged that they've replied on their blog if i've commented and i don't bother to check whose post i commented on. for example, if you replied to some of my comments on your blog, chances are, i dont know about it. Your new header looks amazing! I love to change my blog design from time to time too! Eh, we all have to progress with our skill somehow, my earlier works were horrendous! You are soooooo talented!!! I am genuinely amazed that you created that by yourself GIMMMME YA SKILLS GAL! I love the new title :) did you draw that?! SO GOOD! It's kind of mysterious how the girl transitions from being incomplete to complete! ...or are they different girls... LOL either way I like the incompleteness!! I haven't been here for a while so I could not tell the difference in the header. I'm glad you put them up for comparison and I see that you've already changed it by the time I read this. Good move! 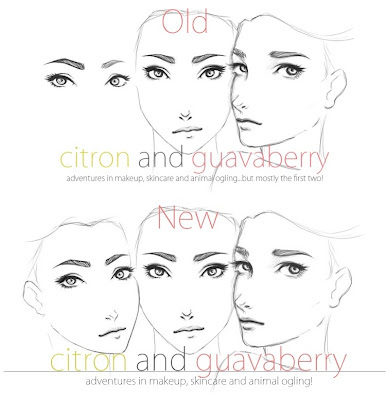 I personally prefer the eyes instead of the whole face on the left. Did you draw them on computer? I wished I knew how to draw those fashion illustration style on computers. I'm still trying them with pencil and paper. It seems like many blogs are in the process of undergoing a revamp and most of them are all the minimalist white style. I'm so glad I'm almost finished with my revamp. I'm still left with tweaking of the sidebar. It took me over 2-3 weeks to slowly tweak them during pockets of free time. How about you? Do you feel the sense of accomplishment? What are you left with? Social media buttons? I added these to my blog during this revamp too. I WOULDN'T do so in the past coz I wasn't too public about my blog a few years back. I started opening up because of an incident and found so much warmth in the blogging world. I COULDN'T do so because I didn't have much social media platforms too and too few buttons look kinda strange right? I gradually signed up for Pinterest and Instagram and so giving me the impetus to do those buttons. It depends on what you feel. I think it's nice to connect with your readers via other platforms too. If you have instagram, I would definitely connect with you there! Heh, a large majority of people preferred just the eyes! And yeah, I drew them on computer. About time I used my tablet! Yeah, I really do like the minimalist white style. It's clean! I on't know actually, getting everything and redo-ing certain things was frustrating, but I like my blog now! Hopefully your effort will be all worth it! Pretty header Vans :D I wished I had the time to make one for my boring life page, LOL. Everything looks so clean and crisp!